Longboard and skateboard trucks are the metal t-shaped pieces that are attached to your deck/board and all longboards and skateboards use 2 trucks. The size of the truck are measured by hanger or axle width. Which one to use is not that difficult just check out the text below. Both trucks has similar parts: a base plate, bushings, kingpin, hangers and axles. All these parts impact the behavior of the board as well as your performance. 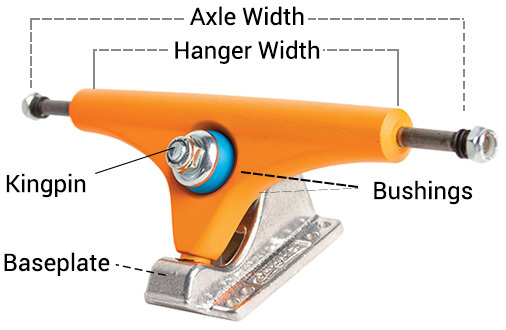 Skateboard trucks are narrower and have a traditional kingpin (TKP). They come in many sizes and you want to pick one with the same size as the max width of your deck. 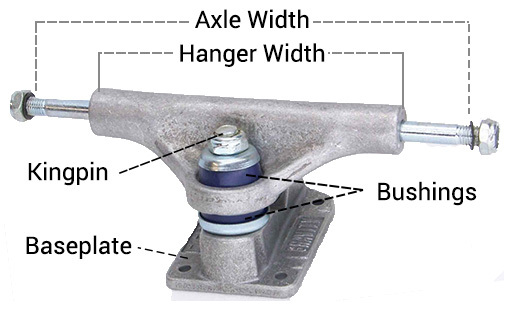 So 6″-7.25″ truck axle you use on a 6,5″ – 7,25″ decks. 7,5″ truck axles you use on a 7,25″ – 7,5″ deck and so on. They are constructed for strength, maneuverability and are shorter than longboard trucks. Longboard trucks are wider, have a reverse Kingpin (RKP) and hangers are mostly 150mm or 180mm. You pick your truck based on the width of your longboard deck. Usually a deck with a 9” width and above needs 180 mm trucks. Anything smaller choose 150mm trucks. They are constructed for Stability, Turn-ability and are longer than skateboard trucks. Although the parts are the same the shape and positioning from the parts are different between a skateboard and a longboard. You cannot use skateboard trucks on longboards or visa versa. It is not interchangeable. This will cause a wobbly longboard and it doesn’t turn well. That’s it for a first comparison. Hope its more clear which truck goes on a longboard and which one goes on skateboard.